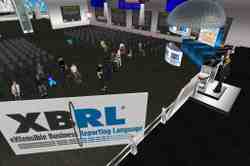 Still unsure about Second Life — the virtual world — as a tool for helping your business do better? Still unsure about Second Life — the virtual world — as a tool for helping your business do better? Besides virtual meetings, the platform is also conducive to training. She goes on to feature our (Maryland Association of CPAs) efforts in Second Life as a training venue. Alexandra DeFelice, Associate Editor of Accounting Technology Magazine described it as, “leap(ing) into the next generation” in an article titled, Tom Hood – Virtual CPA in their August edition. Ryan Sharrow covered our two (2) “mixed reality” events at the Maryland Business & Accounting Expo in his article, Second Life Opens Virtual CPA Worlds in the July 4, 2008 edition of the Baltimore Business Journal. This is in addition to the Journal of Accountancy feature article in June, 2008, titled, Accounting for Second Life. Turns out we were the “buzz” at the AICPA Tech Conference this year mentioned by several speakers according to WebCPA editor Bill Carlino. Bill talked about the trend of “virtualization” and talked about our virtual CPA Island. He also said that virtualization is one of the technology trends that should be “in process” for CPAs and firms. I am very glad to see Second Life getting a fair shake in looking at the training potential of this fun and exciting medium. Check out the video of the session at this link. What do you think – are you ready to try Second Life?